Repairing a Drought Damaged Lawn is Fairly Easy to do. People say to me; “I don’t water my lawn during the summer, I just let it go dormant. It will come back.” Well . . . there’s a fine line between dormant and dead and this year I’m seeing a whole lot of dead. Love to Buy Small Plants from You. It’s true that cool season grasses like we have here in the north will go dormant when it gets hot and dry. But they still need a little water from time to time. If your lawn doesn’t get any water during a hot and dry spell there’s a good chance that parts of your lawn will die and not come back if you’ve experienced a drought. When that happens you really should repair the damaged areas. If you don’t, those areas will fill in with weeds or wanted grasses. Weeds you can control with an application of a weed and feed type of fertilizer, but when those areas ill in with unwanted, wide bladed, ugly grasses, you have a problem because weed and feed fertilizers are engineered to kill broad leaf weeds and not kill grasses. Even undesireable grasses will not be controlled with an application of a weed and feed fertilizer. So . . this is what I do. I wait until mid fall to do anything. Usually here in Ohio the third week of September is ideal because it’s not so hot and when I plant grass seed it won’t need much care. The first thing I do is survery my lawn with a can of inverted orange spray paint in my hand. (you know, the kind of spray paint that works upside down) I draw a circle around any undesireable, wide bladed grasses and or weeds that I want to eliminate. After I’ve marked out everything that I want to get rid of, I go around and spray just those areas with a non selective herbicde that contains glyphosate. I usually use some generic brand of non selective herbicide that contains glyphosate. If you want to beat me up for using or recommending Roundup or Glyphosate you can do that here. The reason that I mark out all the areas that I want to spray in advance with orange paint is so I’ll know where to spray, then after I’ve sprayed I need to know where to plant the grass seed. So I draw orange circles, ovals and triangles all over my lawn. Then I spray only inside of those areas with a non selctive herbicide that will kill the unwanted grasses. Don’t use a lawn weed spray because it won’t kill the unwanted grasses and will only kill broad leaf weeds. You have to use something that is considered non selective but does not linger in the soil. The most popular products contain glyphosate. When you spray use one of those inexpensive (didn’t want to say cheap) pump sprayers, the one gallon size is all I use and mark on the sprayer with a wide bladed permanent marker, “weed killer” so you don’t use that sprayer for anything else. Be careful how you spray. You have to be careful to not allow the spray to drift into areas of the lawn that you don’t want to kill. I do that by adjusting the spray nozzle so the spray pattern is a little heavier and not a fine mist. The heavier spray pattern is easier to control and pin point what you are spraying. After you spray, just leave the lawn alone for 72 hours and give the herbicide a chance to be absorbed and translocated to the roots of the weeds and grass that you are trying to kill. After 72 hours the areas that you sprayed won’t look dead, but they are. Just sprinkle grass seed over the areas that you sprayed, making sure to get good coverage of all of the areas that you sprayed inside the orange circles. Water as needed. Over the next 10 days all of the areas that you sprayed will turn brown and look ridiculous, but as that is happening the grass seed will start germinating and will eventually fill in the areas that you sprayed. Keep in mind, your lawn will not look “normal” until next spring. Repairing Large areas of Lawn Damage. If you have large areas of your lawn that have been damaged by drought you can rent a machine called an over seeder. What an over seeder does is slices the soil a little the drops grass seed as it moves along. I’ve used an over seeder on my lawn and it worked great, but it was a bit of a beast of a machine to use. When I did my lawn I had a lot of weeds that came in after drought damage so I first applied weed and feed over the entire lawn to get rid of all of the weeds then I did the over seeder thing. So you can apply weed and feed to get rid of the weeds. Then if you have thick bladed grasses that you want to get rid of you can do the spot treatment as well, before you use the over seeder. I hope this helps. Questions? I have been farming and gardening for years, there are no organic alternatives to the good job Glyphosate does. We have used so much of it that if this false narrative were in fact the truth, I am sure at least some in my family, including animals, pets, etc would have fallen into illness. Glyphosate is inert within hours after application. I agree with Mike, it is a politically charged issue. I have used other herbicides as well. My family’s doctors and veterinarians are continuously amazed at our robust health and long life spans with very little debility. You are correct. This whole Roundup issue is just a run a way freight train. If only people knew the amount of chemicals that go into everything they consume. People should visit a water treatment plant at least once. They dump chemicals into our drinking water by the barrel full. And yes, bottled water too. Thank you for joining the conversation. I really enjoy your articles and recommendations, but I’m shocked that you recommend glyphosate, which is one of the nastiest ingredients in Round Up, the worst product to hit US agriculture.in our lifetime. We all believe what we choose to believe. Personally, I choose to take a precautionary approach, a “prudent man” approach: Would a prudent man consume chemicals that are designed to kill other living organisms? Would a prudent man choose to accept assurances of safety from a chemical producer who is producing the product for financial gain? Would a prudent man accept assurances of safety from a chemical producer who has a track record of producing chemicals that have subsequently been determined to be toxic to human health? We all believe what we choose to believe until life causes us to change what we choose to believe. But the same prudent man is exposed to and consumes all kinds of chemicals both known and unknown throughout the day. But your right, it’s personal choice. My reaction is the same as yours, Diane and Katie, re: Mike’s use and promotion of glyphosate containing products. Mike, the risk-monger article you sited was written by a man who gets funding from a front group for a multi-international chemical and pharmaceutical company and was a former employee of that company. (No surprise there.) Please check your sources before publishing ‘information’- it could be propaganda as it is in this case. I agree with you, Prudent Mike, its a matter of common sense. A product that chelates minerals so that the plant dies from a severely compromised immune system and malnutrition raises lots of red flags as to its safety for humans – especially for our children. To think that the product does not persist in the soil and does not get into our water systems is naive and wishful thinking. I’d never spray anything where a pet can get to it. I’m trying to bring back St. Augustine grass that has been through a drought. Some of the lawn is still in good shape, but the rest isn’t. Is there a St. Augustine grass seed that I could use or am I looking at patching the affected areas with sod? I’m wanting to bring it back to a great looking lawn. I would just over seed the affected areas with a desirable St. Augustine that you like. Do so in the very early spring/late winter, even now in a warmer zone. Water when dry and the lawn should come back nicely. You don’t have to do a lot of digging, I just sow grass seed over the dead areas and it comes up nicely. The dead grass actually protects the seeds. We went through a drought last year and also had twitch grass. We no longer have any grass. at all. We are on a tight budget but would like to have some grass in our front yard. We were thinking of putting down fertilizer and grass seed. Any suggestions? Use only a grass seed starter fertilizer and buy a good quality grass seed. A good blend. Go to a full service garden center for advice. Big box stores have seed, but if you don’t know what you are buying your lawn could look worse than before. Water, water, water. Straw really makes a difference and might be the only thing that keeps your new lawn alive. I just got done arguing with the trugreen tech that sprayed my lawn. He said its dormant, I said if it was dormant it would still have a root system. I rubbed my foot on what he said was dormant and the brown grass just rubbed off to the bare dirt. Am I right?? There is a fine line between dormant and dead. People always say; “It’s dormant, it will come back.” That’s not always true, a lawn, even a dormant lawn or a plant for that matter, can only go so long without a drink of water. If it doesn’t get the water in time it dies. If your lawn is that brown the lawn guy shouldn’t be applying anything at this time. There are some amazingly beautiful drought tolerant flowers, too. Both pentstamon and salvia are from Arizona and New Mexico, so although they look lush and bloom like crazy, require surprisingly little water. There is a dazzling succulent from Chile named Calandrinia grandiflora with magenta flowers that bloom all summer on long stems. Alstroemeria will go dormant during a prolonged dry spell, then burst into new growth at the rain. We like California poppies and lupine, but they only bloom in the Spring and need to be cut back in Summer. I don’t know if you are aware of this, but scientists have shown that glyphosate causes cancer and is very, very bad for the environment. It is very high price to pay for a little convenience and a pretty lawn. I would suggest that if lawn grasses do not grow well in your area, it might be better to have as little lawn as possible, especially with the drought conditions we are experiencing in many areas of the country, and instead to landscape with plants and ground covers that will thrive in such conditions and add beauty to your environment without doing so much damage to the ecosystem and to human life. I wholeheartedly agree. Mike, I know you have no qualms with using herbicides, but this is a dangerous product in many respects. Respected scientists (including a WHO advisor) states that RoundUp is 1000x more toxic than glyphosate alone, so if that is the only route, please consider using the single ingredient product, and follow ALL safety recommendations. Try to look for organic alternatives. There is a company that provides safe alternatives to the chemical products on the market today, but I most likely can’t mention them by name… but their initials are G A. Love your blog and you always have great information, but I had to chime in on this one, as Kris did. I’d love to see some more information on using more organic techniques! Lorie from Jefferson, GA (and YES, my lawn and garden are suffering, too! It’s very hot here, and the rain seems to always veer around my town… ???). I like Mike’s article on the grass, but I gotta agree with you on the glyphosate. To the contrary, as a Master Gardener, I have had the privilege of receiving a lot of information about glyphosate. It is truly the safest herbicide ever invented. The reason you can overseed the spots you kill out with glyphosate within 72 hours is that such a timeframe is twice the amount of time it takes the glyphosate to completely break down into water and other simple, harmless compounds. An article in Horticulture magazine (I believe it was) which appeared a couple of years back was entitled, “The Truth about Glyphosate”…. which everyone expected to be an exposé on the horrors of it. But, the “truth” revealed in the article was quite the opposite. The magazine cited study after study and scientist after scientist to prove that, in fact, it is virtually harmless. My take on it is this: it is more likely that the compounds formed in your municipal water supply during chlorination will cause you cancer than the glyphosate concentrate you add to it when mixing it up in your sprayer. So, DON’T DRINK THE WATER. Thank you so much for sharing this very enlightened information. Likely to fall on deaf ears to those who have already formed an opinion but should enlighten the few with an open mind and willing to listen to reason. Also banned in The Netherlands and France , and Brazil will likely soon follow. Here in California the drought is so serious that most of us have replaced lawns with native plants and rock. In Las Vegas they are paying people to take out their lawns and replace with native plants.! I have a drought tolerant ground cover called dwarf plumbago (Ceratostigma plumbaganoides) with intense blue flowers that I have used for years. No mowing and very little water. HI Mike, what is the cheapest way to fertilize Bermuda, and is also safe around dogs. I live in southern California. I don’t have much money and I’m trying to spread Bermuda grass across to the other side of my yard (my dogs drag in so much dirt into the house) and this fall will try to fill in with grass seed. Debbie, the cheapest and most effective way to fertilize a lawn is with a generic, private label fertilizer from you farm supply store. Is it safe for dogs? I don’t know, you’d have to read the bag. need to get rid of this horrible stuff. I’d suggest spraying again, then spray again once a week until it’s dead. Then over seed. Don’t do any digging, chopping or digging after you’ve sprayed for at least 72 hours after the last spraying. Rather than Roundup (glyphosate), I’d suggest Fusilade. It acts slower, works only on grasses, and with 2 applications it will kill bermuda back all the way to the end of the root system. I’ve had excellent results controlling bermuda in my flower beds. My lawn is bermuda, and as you mention, it gets into the beds fast. With a couple of applications of Fusilade per year I have no bermuda in my beds.at all. Thank you for your feedback, everything you pointed out makes complete sense. The difficulty is coming to terms with the fact that we and our neighbors will have such an eyesore for the summer, fortunately for us they are very understanding. Regarding the tip on the straw, if I am not mistaken this comes in rolls using a nylon mesh preventing it form blowing away in the wind. Do you have any pro-tips on how to remove the nylon later preventing it from getting wrapped up in the mower? Last year I fertilized my lawn with an anticipated rainfall within 72 hours which never came compounded with the drought we had last year. This year the lawn looks terrible, to put into perspective when I have shown people pictures they thought I had already begun the repair process mistaking the dead grass as Penmnulch. I have acquired bids for an irrigation system along with proposals for repair. I few contractors have pointed out I have a grub problem as well. I have been presented with repair costs ranging from $10k to $20k for my 1/3 acre lot which excludes the irrigation system! I am open to suggestion, however I am also looking for affirmation that I have correctly understood the advise contained with in this thread. I appreciate any help/advice anyone is willing to offer, I do not want to be cheap but certainly do not want to over-spend either. Ultimately I want to do what is right so as to not to be in this situation again. I think you are on the right track with your plan of action. The only concern that I have is re-doing the lawn so close to the time the irrigation system is installed. Installing the irrigation will involve some digging where they push the irrigation under the driveway and sidewalks. Make sure those digs have settled completely before installing your lawn. Think about your timing. It’s mid May, great time for seeding a lawn. But depending on how long it takes from today until the day you seed the lawn you could be trying to establish grass during very hot humid months of the year. Yes, you will have an irrigation system but keeping things watered as needed during the hottest days of the year could be tricky. A few things to consider. 1. Small grass plants, once germinated are as tiny as a human hair. Just a few hours without water when they desperately need it and they will fail. Once that happens the seed is spent and will not re-grow. 2. Watering when it is hot and humid can cause a condition known as pythium blight which is driven by humidity and it attacks Perennial Rye Grasses killing them off in areas of your lawn that hold too much moisture. Usually along driveways and sidewalks where the irrigation water runs off the concrete and makes the soil along the edges extra wet. That will leave concentrations of Bluegrass in your lawn. Sounds okay, but you’ll have dark, dark greenish blue spots when the rest of the lawn is lighter green. Whatever you do, don’t use a blend of grass that is mostly Kentucky Bluegrass. You need a blend with some nice perennial rye grasses. You don’t have to buy the most expensive seed on the market, but don’t go cheap either. Buy your seed from a full service garden center, they usually carry good stuff. Kentucky Bluegrass takes 28 days to germinate. Weeds take about four. Guess one will fill in your lawn first? Perennial rye grasses will germinate in four to six days acting as a nurse crop for the Kentucky Blue as it does it’s thing. About the pythium blight and the hot summer sun. 1. Use straw even if you have a mulch similar to hydro mulch. It’s worth the extra effort. Straw actually shades those tiny grass plants. 2. If at all possible, postpone the seeding until early to mid September. It would be so much worth the wait to get a really nice lawn and not fight with the elements of summer and humidity. Have you ever dealt with dodder vine. I have a upland behind me and suddenly this year dodder vine has taken over my wild flowers. I cut out the plants but I know lots of seeds dropped and I am afraid it is going to get in my yard garden. Plus,how to treat for all the moles? The yard is pretty bad and I can’t track the mole tunnels enough to trap them. Live in lower Michigan. Between 5 years of neglect by prior owner, drought and moles, the lawn is trashed. Will all the above advice apply also? Is next week or 2 too late to seed is SW Ohio? Between the grubs/moles/drought my beautiful lawn looks awful!! Priddy, you can plant grass seed right up until mid October or so in Ohio. It might be slow to germinate, but by spring it should be up as long as the soil isn’t soggy over the winter. Then the seed can rot. but it’s definitely worth a try. I have a large area of grass with patchy spots and crab grass. I have used straight vinegar in a pump sprayer. Seems to kill the crab grass and then over seeded area 7 days later. Applied vinegar application after Labour Day. I have a large portion of my yard that is damaged from drought. I had a man use the overseeder machine to seed the lawn and he said to water it every 3 or 4 days, leaving the sprinkler on about 45 minutes. I did this after he seeded the lawn but the next day it seemed dry so I watered again. Is every 3 or 4 days often enough? Also, I should have waited until fall, thought he should have told me this because it has been in the low 90’s here in Dayton, OH. The watering is going to cost a lot, watering 2 or 3 hrs. each time. Please advise. 3 or 4 times a day would be often enough. It is good you felt the ground. Fresh seed or grass shoots can dry out in just a few hours when we have days over 85 and the sun beating down on this Ohio clay. Fresh roots do not go down very far. Set your watering for timer early in the morning, late morning, and early afternoon. Don’t water in the evening unless the plants really need it. Letting the soil stay drier overnight helps discourage fungus. Hi all…I used weed and feed on my entire lawn, and it did absolutely no good…I have more clover and crabgrass than ever. My entire back yard is loaded with crabgrass, the front with clover…looks ridiculous! So should I try the round up trick on selected crabgras, and all over the clover? Then wait 72 hours to reseed…mid September? I suppose it can’t hurt…The clover and crab grass moved in during the drought…hopeless in Cleveland! WE don’t do anything and our lawan will be fine and healthy looking next spring.I don not care for chemicals and herbicides in and around our property. If our summers continue like this, I say just let nature fix it. When is the best time to prune and shape a japanese maple (dark red wide leaves)? I also hav a small feathery starter that is growing crooked, how do I shape that? Kinsella, you can prune a Japanese Maple any time of the year. I prune mine any time I’m walking by and see something that needs pruning. To straighten a crooked tree just put a stake next to the tree and tie the tree to the stake with strips of cloth. So if there’s kind-of large dead spots in hard dryed up sod how do you loosen the top of the ground so the seeds germinate? Judy, a Mantis tiller would be perfect for that job but if you don’t have one you can loosen soil with “Four Tine Hoe”. Looks like a hoe but has four tines instead of a blade, available at any hardware store. When using any herbicides, whether non-selective or a lawn weed spray, I always add a dose of dish detergent to the mixture. The soap acts as a surfactant (grease-cutter)and allows the herbicide to penetrate the weed’s leaf structure much better than without the detergent. 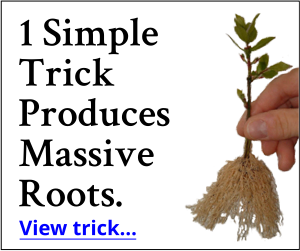 I also have used this method to successfully eradicate an invasion of gout weed and ground elder. After that, follow Mike’s advice on seeding. Andrew, you are right about the dish detergent. Dish detergent mixed with water actually helps to break the tension of the soil surface to allow water to penetrate more easily. This is especially true when trying to wet any kind of soil that contains peat moss. Mike, Should I thatch the dead areas of my lawn prior to over seeding? Hank, if you have a great deal of thatch in your lawn I’m sure it would help, but these days not many people or companies do any de thatching. Probably because picking up the thatch is a lot of work. Roundup is the most dangerous chemical on the planet. Serious, and varied, medical problems years later. My husband died after years of illness. Read about the side effects. Wish we had a bit of drought here in Ireland. Looked out this morning and my rose bed was an island surrounded by water. Very wet summer. Still my escallonia and fuschia cuttings are thriving. (White plastic bags are a great idea.) The cruise is getting nearer. Thanks. Eamon, I’m glad you are having great success with your cuttings in Ireland! My father late father was Mount Charles in the Donegal area. Would it hurt to use a pre-emergent more than twice a year? I have St. Augustine grass which normally chokes out weeds pretty well, but this year I seem to have a lot more weeds. I use pre-emergent in Fall and early Spring. What do you think? Patty, I appy pre emergent herbicides to my nursery crops several times per season. Pretty much on an as needed basis. What about timing for warm season grasses, like Zoysia, in NC? Carolyn, since Zoysia goes dormant I think early fall would be a good time to start new grass. I called Weed B Gone and they said not to reseed for 4 weeks. Therefore, if you are going to use a weed and feed you should do it now so you can reseed in mid-Sept.
Jim, thank you for that information! Do i need to rake in the new seed or just leave laying on top and water in? Shandal, don’t rake it in, but drag a broom over it backwards to mix it with the soil and cover it slightly. Thanks for the article. Just in time, too. I now stare at a front lawn just full of weeds and was mulling around how I was going to handle it this fall. How long should I wait to over seed after putting down the weed & feed? Probably a week or so is all you need to wait to seed after applying weed and feed. if you just put down weed and feed you cannot reseed for 4 to 6 weeks as it will not germinate. put the weed and feed down and wait until next year to reseed. That depends on what’s in the weed & feed. Only a pre emergent will keep seed from germinating and only crab grass preventers contain pre emergents which is an early spring application. hi Mike,Thanks for the tips on the drought ridden grass. Same here in Southeast Michigan. If using the weed and feed before the over seeder, how long do I wait after applying the weed and feed before I go get an over seeder? Great articles youve been writing!! I have a file with your name on it and save all of them!! Apply the weed and feed then wait about a week to over seed. Joe, Weed B Gone is for lawn weeds and crabgrass so it will take care of broadleaf weeds and crabgrass. But if you have thick bladed grasses such as quack grass in your lawn it won’t kill that. Weed B Gone is considered a selective herbicde since it won’t kill lawn grasses. In order to get rid of thick bladed grasses you’ll need a non selective herbicide. Mel, you should be able to do it exactly the same way that I’ve described for northern grasses. We have St. Augustine grass, too, here in Charleston, SC. We have to replug or sprig it. How long do we have to wait? Judy, once you get rid of the weed you can re plug your lawn in 10 days or less depending on the product you use to get rid of the weeds. Our front lawn was sodded over some very compacted soil in spots. It has high spots and low spots. Do you have any suggestions for us? Very frustrating. Kaite, aside from digging it up and grading the lot about all you can do is fill in the low areas with soil and seed. fall as the ideal time to reseed. Mid fall means October to many, which is the WORST time to seed! 2) When a selective herbicide (“Weed ‘n’ feed”) is applied, you need to wait up to six weeks to reseed. As you said, with Glyphosate (“Roundup”) you can re-seed only a few days after application. Lewis, I agree, I like re-seeding in mid September but Labor Day is fine as long as a person keeps the new grass watered once it starts to germinate. That’s for the info on WeedBGone. Will try your suggestions before I ask my son to bring the tractor and plow to town! Our front yard is pretty much gone. Thanks so much for your timely emails throughout the year! Judy, good idea! Plowing up the lawn is not something you really want or need to do. fall as the ideal time to reseed. Mid fall meaans October to many which is the WORST time to seed! Lewis, thank you for saying this. By fall I like to plant grass seed in the second or third week of September.